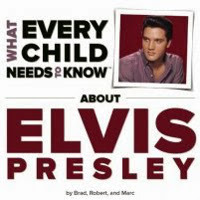 The 22 page book “What Every Child Needs To Know About Elvis Presley” was announced by the UK based Need2KnowBooks with March 11, 2014 as the release-date. “Elvis Presley was called “the King of Rock and Roll.” His life and music transformed society in ways that are still felt to this day. With honesty, integrity, simplicity, and humor, “What Every Child Needs To Know About Elvis Presley” explains this pop icon to young children, helping them to understand the modern world and, more importantly, the adults in their lives.